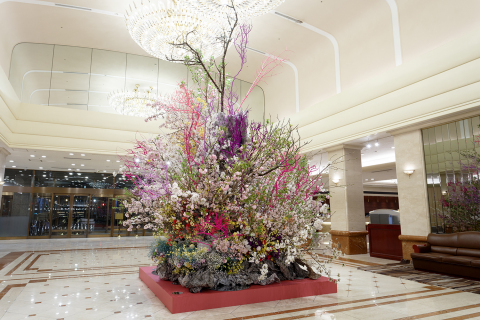 Keio Plaza Hotel Tokyo Hosts "Cherry Blossom Spring Fair"
Keio Plaza Hotel Tokyo (KPH), one of Japan’s most prestigious international hotels located in Shinjuku, Tokyo, will host a “Cherry Blossom Spring Fair” from March 1 (Thursday) to April 30 (Monday), 2018 at eight of our restaurants, including French and Italian Cuisine, Chinese Dinning, Japanese Kaiseki Cuisine, and Korean Dinning. The executive chefs at each restaurant will serve specially prepared menu items based on the theme of “Sakura” Japanese cherry blossoms and matched with champagnes and wines. Our hotel will also display special flower arrangements and other decorations to commemorate the arrival of spring and cherry blossoms for guests to enjoy and take photographs. March and April are the busiest months for guests visiting Japan, and coincide with the very short period when the cherry blossoms are in bloom. We host this “Cherry Blossom Spring Fair” to provide guests opportunities to experience the fleeting but beautiful cherry blossoms in the comfort of our hotel. Our sommeliers will also select special champagnes and wines to match our delicious foods at special prices for this Fair. *Prices include service charges and tax.